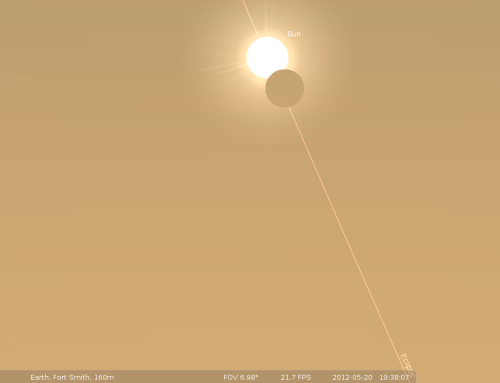 Don't throw away that solar filter yet, at least not until you have the opportunity to see the transit of Venus across the solar disc on June 5, 2012. This will be the last Venusian transit until 2117 on the calendar, so its fairly safe to say it will be the last one any of us has the opportunity to see. This transit of Venus will begin at approximately 5:10 CDT, on June 5, 2012. The previous transit of this sequence occured over the EuroAsian countries in 2004. Then, I was monitoring the transit via the world wide web from the Van Buren site of Coleman Observatory. It took most of the night to watch the tiny disc of Venus as it touched the solar disc, and progressed across the disc then left it a few hours later. 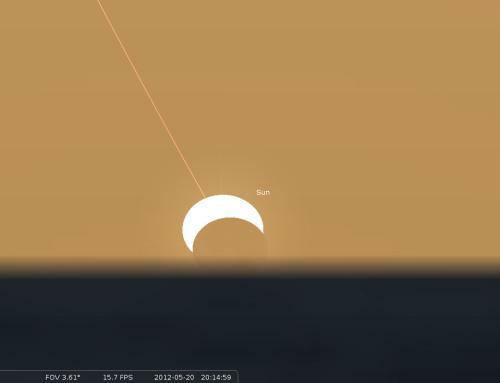 This is a picture of that eclipse from a Swedish observatory where they employed an H-alpha (hydrogen-alpha) filter that gave the totally different view from this projected image I obtained with Stellarium, the FREE astronomy software available from stellarium.org for anyone to download and use. I missed the start of this transit by several minutes. Setting up my scope and balancing it took longer than it should have, but I did start taking images by 5:30 pm. This time, its the other side of the world that gets treated to this transit. There may be a narrow band of area on Earth running N-S that had glimpses of the 2004 AND the 2012 transits, but its essentially "our" turn this time, even though we'll only see the beginnings of the transit until roughly mid-transit as these last images show. Using the zoom feature on my Canon PowerShot A10 got me this close-up of the sunspots and the "dot" of Venus.
. I broke down my rig early after some 20 images didn't get me any more than these three as far as a different look went. All in all it was fun, but sort of tedious looking essentially the same for the middle 2/3 of the event. AND, AS THE SUN AND VENUS SLOWLY SET IN THE WEST....the 2012 transit of Venus comes to an end, at least for local folk like me. Sure, this isn't a really big deal, for the person on the street...but for amateur astronomers who know of and can appreciate the rarity of this particular event, its the last one we have an opportunity to see for the remainder of our short lives. ENJOY!!! NEVER use a telescope to view the Sun, unless you use PROPER, SAFE solar filters. Instant and permanent eye damage may result! Proper filters cover the opening end of a telescope and must be rated as allowing a maximum of only .001 of 1% of visible light transmission. If you own a small telescope that utilizes a small screw-on filter that attaches to the eyepiece, THROW IT AWAY! These eyepiece filters can break from the intense heat of the Sun and you can not move fast enough to keep from being blinded PERMANENTLY! Mercury is the innermost planet of our solar system. Being so close to the Sun it automatically has a very rapid orbital period. This gives Mercury a "year" of only about 88 Earth-days. On occasional orbits around the Sun, Mercury happens to pass in front of the Sun's face as seen from Earth, and when this happens, its called a transit. AOAS will not be offering public views of the November 8 transit. 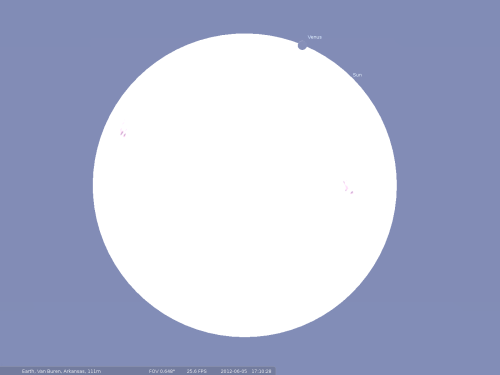 But for anyone who wants to see this event, we have some web addresses where visitors can view the transit from many different telescopes located in some far-flung places around our planet. UPDATE: I have posted two of my images of the transit. The one below lists the equipment used. The second is available by clicking on READ MORE below. This image of the Venus transit from June 8, 2004 was taken with my digital camera as it appeared on my monitor while watching the event "live" via webcast from two different solar observatories in the eastern hemisphere. Click "Read More" below to go to the web addresses for live views of this next transit on Nov 8. Click here to see my album of images of the Venus transit of June 8, 2004. AOAS members at our October 6th meeting discussed the possibility of hosting the public to view this semi-rare event of Mercury transiting the face, or disk, of the Sun. When we considered the day of the week, the absolute necessity of having a solar filter for magnified views of the tiny disk of Mercury, and the "oomph", if you will, the amount of bang for the buck invested, we decided NOT to setup our telescopes for this event. Mercury transits the Sun on average about 13 or 14 times each century. I watched the November 1999 Mercury transit from my home in Sallisaw with my dad. His eyes didn't allow him to see the tiny (and I mean, TINY) pitch-black disk of the planet near the edge of the solar limb, but I could see it without too much trouble. But as I watched the event over a short period of time, I had to wonder what all the hooplah was about for planetary transit in the first place. I mean, when it comes right down to it, you need a telescope with a proper and SAFE filter for viewing the Sun, and lots of patience to watch the event as it slowly drifts across the disk. Here is one of my first images of Mercury just after it had begun its transit. Notice the nice sunspot near the limb. This image is taken with a Meade ETX125-EC w/o drives, and withmy home made solar filter with Baader Astro Solar Safety Film. I used a 26mm Plossl eyepiece. The camera is my Canon PowerShot A10 at nearly full zoom (about 4.5X ?) and on automatic. 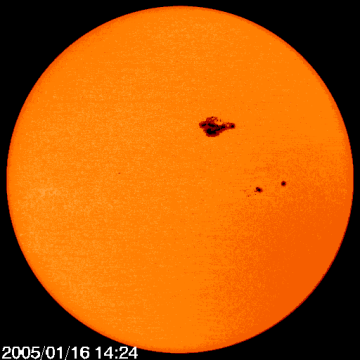 In 1999, the event was a very "shallow" transit, meaning it entered and crossed near the edge of the Sun's disk giving a length of time of only an hour or so from start to finish. 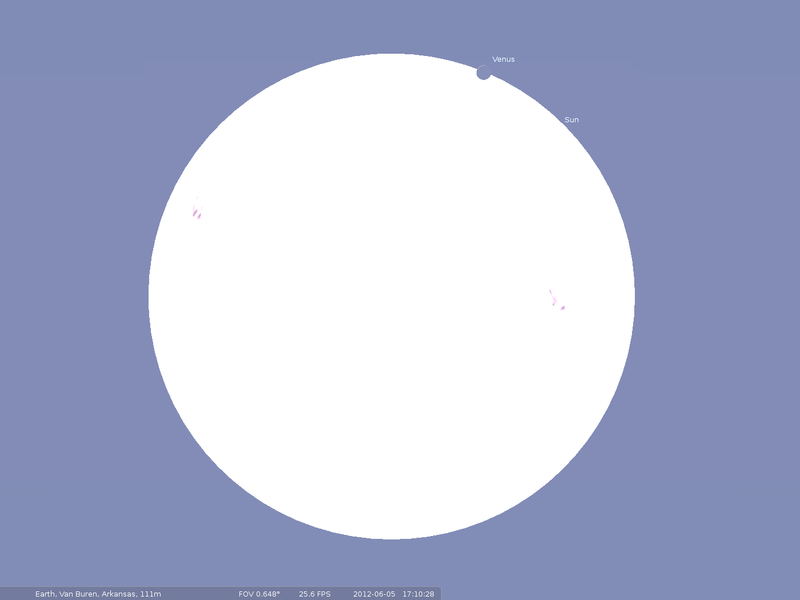 This transit on Wednesday, November 8, 2006 will be a much "deeper" transit across the Sun's disk, and the event will last 5 hours, from around 1:12PM when it first touches the Sun until just after the Sun sets in the west as seen from Van Buren. Folks need to be west of a line running north-and-south through the Rocky Mountains in order to be better placed to allow viewing of the entire transit. Hawaii and Australia are best placed for this particular transit. But, knowing that there will likely be people wanting to see this event, we offer this link to the Exploratorium for a live feed of the transit as it progresses from observatories around the world such as Kitt Peak in Arizona , or possibly Keck or any of the other of the myriad observatories located in Hawaii. This will assure everyone interested that you'll be able to see a live streaming video of the entire transit, all 5 hours of it, without interuption from clouds or other disturbances. Visitors to the Exploratorium will also find detailed explanations as to what a transit is, and how to view it safely. There is much information on past transits and future transits as well. So, visit AOAS when we have one of our frequent nighttime viewing events. We'll gladly show you dozens or even scores of dim deep-sky and planetary objects. But for the November 8, 2006 transit of the Sun by Mercury, go to the Exploratorium, or perhaps another site to watch this event take place in complete comfort and safety, and enjoy a ton of other information about what's going on, too. Click read more for another image after nearly an hour into the transit. 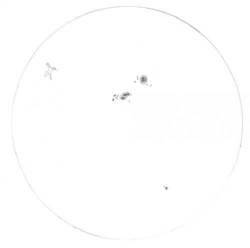 Two sketches of the solar surface showing sunspots by Jon Stone. I've always been fascinated with sunspots and with viewing the Sun in general. When I bought my 8" Celestron Dobsonian in February of 2005, I wanted to use it to see everything it was capable of showing me. One of the things that I really wanted to buy was a solar filter, and I was just about to spend $40 on one when Bob told me he was about to purchase some Baader AstroSolar filter material. So, I waited until his order came in and then I bought enough material from Bob to make a full-aperture filter for my scope. The instructions for making my own looked simple enough, but my first attempt didn't turn out very well. I needed some help and Bob salvaged what I hadn't ruined and gave me a proper fitting and very effective solar filter. The first time I observed, I was expecting to see prominences around the edge of the Sun as well as any sunspots that might have been in view. After learning that I'd need a filter which isolated a certain wavelength of light to show the prominences (about a $500 to $3,500 investment) I decided that what I was able to see was good enough for the $20 I'd spent for this "white-light" filter. Bob told me that he had once observed and made sketches AND taken photographs of the solar surface for 29 straight days in 1991. The Sun rotates in about 26 days so that allowed him to see one complete revolution of the solar disk. That encouraged me to want to try this for myself. I was pessimistic that I would reach that many consecutive days of viewing the Sun due to what I've learned about this Arkansas weather. It seems that cloudy skies are very common here. Happily, though, I was able to reach a total of 36 straight days and beat Bob's former record of 29 straight days. 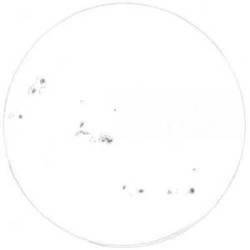 I would only miss one day, however, before we got more clear skies for a few more days and that gave me a chance to keep tracking a group of sunspots that I'd been following for nearly a week. My streak, however, lasted only four more days due to the clouds from Hurricane Dennis moving in that provided for nearly a week of obscured viewing. I was glad to have gotten that many days of observing under my belt, and I'm proud of myself for sticking it out for as long as I did. I hope everyone enjoys my observations. I have compiled a PowerPoint presentation of my sketches that you can click on below, containing 42 total frames which run for 44 seconds after clicking on it. Each slide advances automatically, and I have included my notes about my observations for a total of 41 days of observations. Click on this link to view my ppt. Click on "read more" for my daily observation logs. On June 21, Cosmos 1 - the world's first solar sail spacecraft - is set to launch atop a converted ICBM from a submerged Russian submarine in the Barents Sea. Regrettably, the COSMOS 1 Solar Sail spacecraft was lost shortly after launch. The booster rocket failed to operate as planned, and it appears the COSMOS 1 fell back into the Bering Sea having never reached orbital speeds. AOAS wishes to express our deepest sympathies to the Planetary Society and Cosmos Studios, and we'd just like to say......For Carl's sake...... "Let's try again!" The Planetary Society and Cosmos Studios invite you to join us by becoming a member of the Solar Sail Watch Team. All of the necessary information is described on our web site, including a cooperative linkage we have with Heavens Above for providing viewing information. If you would like to join our Solar Sail Watch Team, please contact Alice Wakelin at (626) 793-5100 or by email at tps.aw@planetary.org. Thank you for your support. A - STRONG - Coronal Mass Ejection (CME) has been detected and reportedly headed towards Earth. Power companies and airlines have been warned again of strong auroral and solar storm activity from January 16 through January 20. UPDATE 2: THEY KEEP COMING!! A *3rd* and possibly the strongest yet CME has been observed bringing even more solar particles towards Earth. There have also been 3 extremely powerful solar flares associated with each of these CME's. The sunspot region below (Region 10720) is also capable of producing even more events until it passes beyond the western solar limb in 4-5 days.The SOHO link below will show the current position of region 10720, and auroras are still possible through early morning hours of January 20. Watch for auroras in the northern parts of Arkansas and Oklahoma from tonight through the morning of Thursday January 20th. The chances are still HIGH that an aurora WILL be visible any of these dates. TWO CME's have been detected and now a 3rd with even more significant amounts of solar particles still headed towards Earth. There are NO dangerous effects from these CME's, but they are responsible for the occasional auroras we see in mid-latitude regions of the world as well as electrical grid disruptions. Anyone may attempt to capture this auroral activity with any camera which can be set to "manual" and which will accept a cable release. Use 400 speed film or faster...camera on a tripod w/cable release...expose for 15 seconds up to 1-2 minutes with shorter times for brighter portions of an aurora (15-45 sec)...watch for yellow or orange bands extending upwards which MAY show some "curtain" effect I.E. waving as if in a breeze. See "A Solar Connection to the Aurora of November 7, 2004"
Watch for any "skyglow" on the northern horizon as if there were a LARGE city just beyond your view. This will appear as a greenish-white band near the northern horizon. Watch for any reddish-orangish or yellowish "glow" blending with the upper fringes of this greenish horizonal "glow". DRESS WARMLY to be able to watch as long as possible. Auroral activity comes in "waves", meaning that the activity can change dramatically over a very short period of time. What might not be more than a greenish glow at the northern horizon can suddenly flare up to reveal huge areas of reddish to orangish color, and may on rare occasions turn bright green or blue. The activity is expected to be fairly high during this event through Thursday Jan 20, with the best activity Tuesday, Wednesday and/or Thursday nights. This event is expected to reach as far south as the mid-US, but there is at least a 50-50 chance of an aurora. Clarification: Moonlight this evening MAY hinder the intensity of any visible auroral activity. Likewise, observers from within city limits may also see little if any auroral activity. If viewing from within city limits, try and find a shadowed area away from most street lights. Better views will be had after moonset around 2:30am Tuesday and around 4:45 am Thursday. Solar image from Solar and Heliospheric Observatory (SOHO) MIDI Continuum image from January 16. Aurora image by AOAS astrophotographer Mike Holloway of the Aurora of Nov 7, 2004 from north of Van Buren. Earth's premier Solar observation platform. When you want to find out what the Sun looks like today, you dig out your solar filter and drag the scope outside for a quick look, right? Or, you might just go to your computer and pull up the SOHO site. Here, you'll find not only the latest images of our Sun from one of the instruments on board SOHO, but LOTS of other stuff as well. An extensive archive of images will take you almost back to the vehicle's launch date of December 2, 1995. The images may be ones like these from July 23, 2003, taken by the EIT (Extreme Ultraviolet Imaging Telescope). EIT is able to image the Sun's transition region and inner corona in four selected bandpasses at wavelengths of 171a. (angstroms), showing the spectral lines of iron (Fe IX/X), 195a. (Fe XII), 284a. (Fe XV) and 304a. showing the doubly-ionized helium lines of (He II). Other instruments reveal yet more spectacular images. The MIDI/SOI (Michelson Doppler Imager for Solar Oscillations Investigations) studies the solar interior structure and dynamics of the Sun. Make sure the envelope is large enough to accept a CD-ROM jewel case. A new updated version is due out in the near future.Check out the SOHO site, images and science experiments. A fascinating experience and beautiful images await. Engineers are predicting this problem after detecting a malfunction in the pointing mechanism of the satellite's high-gain antenna (HGA), which is used to transmit the large amounts of data from SOHO's scientific observations to Earth. The SOHO spacecraft is operating as safely as before the problem occurred. Its low gain antenna, which does not need to be pointed in a specific direction (omni-directional), will be used to control the spacecraft and monitor both spacecraft and instrument health and safety.